Frederick White Soft Winter Wheat was developed under the auspices of the Ontario Cereal Crops Committee and does well in our area. 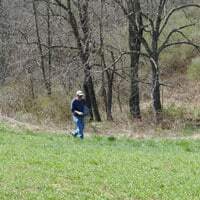 In 2018, Frederick Wheat was grown in Independence Township on 5.5 acres on the farm established by R. Meloy, Esquire in 1829. Meloy was a farmer, grain, stock and wool grower. More recently the farm was a dairy farm and a cattle farm. Weatherbury Farm has farmed this land since 2015. The Frederick Wheat was planted on October 22, 2017. Clover was frost seeded into the grain on April 23 2018. 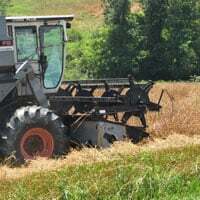 The Frederick Wheat was harvested on July 4, 2018. At the 2018 Washington County Fair, the Frederick Wheat sheaf won 1st place and the jar of Frederick Wheat grains won 2nd place. In 2012, the Frederick Wheat sheaf won best of show. In the many years we have been going to the fair, this is the only time that a wheat sheaf won this honor. For a more detailed explanation of how Weatherbury grains become flour, visit the from seed to flour page. 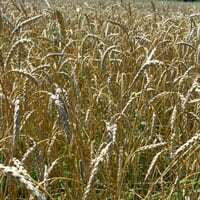 More information on Frederick Wheat and other grains grown by Weatherbury Farm are on the grains we grow page. To read more about pastry flour (made from Frederick Wheat), please visit our products page. Pastry flour can be ordered on our order page. Frederick Wheat Field : Look closely and you can see the frost-seeded clover in the undergrowth.